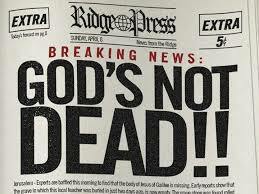 Tonight, Wednesday September 10th at 6PM at The Lighthouse Church, we are featuring the film entitled God’s Not Dead! We will be showing it free of charge in our Sanctuary and the movie snacks are on the house. This movie that was recently shown in local theaters tells the story about an atheist Philosophy professor at a University who insisted that all of his students who took his class write and sign on a piece of paper the phrase declaring that “God is dead.” He did so as an act of intimidation to bully and belittle any so called Christian individuals who still chose to live in the dark ages and commit intellectual suicide by their choice of having faith in a Supreme Being. Personally, I don’t believe in atheists! Just the concept of atheism forces you to consider a deity that you don’t believe in. I would offer that a true atheist would not even acknowledge the existence of a God not to believe in- to begin with! But because there is too much evidence of the raw facts that we have design and we have creation and it is beyond ignoring- this logically points to the result that there must be a Designer and a Creator behind it all. So I would agree that there are such people as agnostics but atheism is a myth made up in man’s mind to make an excuse for the simple truth that he or she does not want to be accountable in any way to a higher source other than their own reflection! It takes way more faith to buy into random and coincidental evolution than it ever calls for to believe in Intelligent Design! There is too much thought and order and symmetry and majesty and beauty in our Universe to just cast it off as nothing more than a stroke of mere dumb luck. I marvel at how we call ourselves the most intellectually advanced society that ever walked the earth and yet so few people actually do their own homework these days. Too many just regurgitate the propaganda that was force fed them without doing any personal research on their own. How can one truly critique a Bible that they have never read? How can one just dismiss the resurrection of Jesus when they have not truly considered and weighed the overwhelming evidence that surely demands an intelligent verdict? Too many people spend more time planning their next vacation rather than thinking honestly about questions of eternity and if it does exist, what does it mean to the way we choose to live now? Jesus always encouraged his disciples to ask questions. Doubt is the ants in the pants of real faith! If you are in a religious system that doesn’t encourage you to ask, seek and knock then move on to a place where you are allowed to love God with your mind also. I believe that not every question will ever be answered this side of heaven. Faith itself must recognize that a finite man or woman could never fully comprehend an infinite God. If we could- there would be no need for faith and without faith, it is impossible to enter into a relationship with the One who made you. But I don’t check my brain at the door when I enter the pulpit. I would argue that too many so called intellectuals are afraid to examine the truth with an open heart and a genuine open mind. I have found that my faith has found a resting place because I did my homework! The Bible is not afraid of atheists! I would challenge that it is quite the opposite. Don’t just follow the crowd blindly. Don’t become anything more than a lemming looking to launch itself off the proverbial cliff. Know why you believe and I dare you to know why you don’t believe! And if you don’t, let’s hope that your answer is better than a snobby, “Just because!” God’s not dead- no He is very much alive and if you are going to bet your life on His disappearance, I would at least soberly warn you to make you sure you know what you are doing and don’t just do it because it will give you permission to do what you are doing! Even if heaven was never promised to me- morality and integrity itself come from the basis of Christianity and if you remove that foundation from our culture, then don’t be surprised when your house of card crumbles upon your own sinking sand! You can’t have it both ways! Be very thankful that God is not dead- no He is alive. Because He lives, you and I can live also and not just here but also for eternity there with Him! What hope does an atheist offer? Exactly!